Verma was surrounded by her husband Sanjay, daughter Maya, son Sean, as well as her mother and sister as she took the oath. NEW YORK: Seema Verma, President Donald Trump’s choice for Administrator of the Centers for Medicare and Medicaid Services, was sworn-in by U.S. Vice President Mike Pence, as she placed her hand on the holy Hindu text- Bhagwad Gita in the presence of her family. 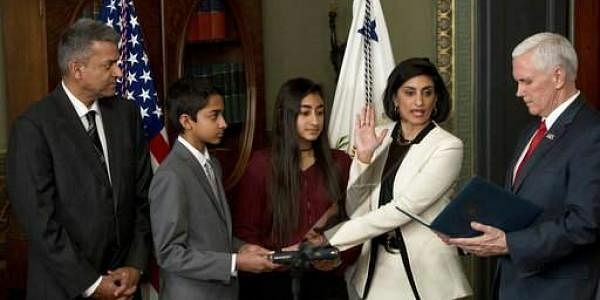 Verma was surrounded by her husband Sanjay, daughter Maya, son Sean, as well as her mother and sister as she took the oath, following which she was introduced by Pence as “one of the leading experts” on state-based healthcare solutions in the country, chosen by President Trump. “The President has asked you to bring your expertise to D.C. We’re confident that you’ll help restore health care decisionmaking to the states, and in the process help make the best healthcare system in the world even better,” Pence said. After her swearing-in ceremony, Health and Human Services Secretary Tom Price, M.D., and Verma took their first joint action, cosigning a letter to the nation’s governors affirming the Department’s intent to work with states to improve the Medicaid program and the lives of those it serves. White House press secretary Sean Spicer had said earlier in a briefing that President Trump looks forward to having the “spectacularly qualified and experienced” Administrator Verma finally onboard, especially as the U.S. Government continues to lay the groundwork for the reform of the healthcare system. Verma was confirmed by a divided U.S. Senate which voted largely along party lines and after Democratic attempts to delay what was an inevitable appointment in a Republican majority Senate. This was unlike the confirmation of most other Indian-Americans in the past who have usually been endorsed in a bipartisan vote or by a large majority. However, Verma faces an uphill task now as the Congressional Budget Office, considered a non-partisan body, estimated that the first tranche of the GOP’s American Healthcare Bill, for “repealing and replacing” Obamacare, would leave 14 million people uninsured in 2018 and 24 million by 2026. Verma is now second Indian-American to be in charge of a plum administration post, after Nikki Haley- the US Ambassador to the United Nations.